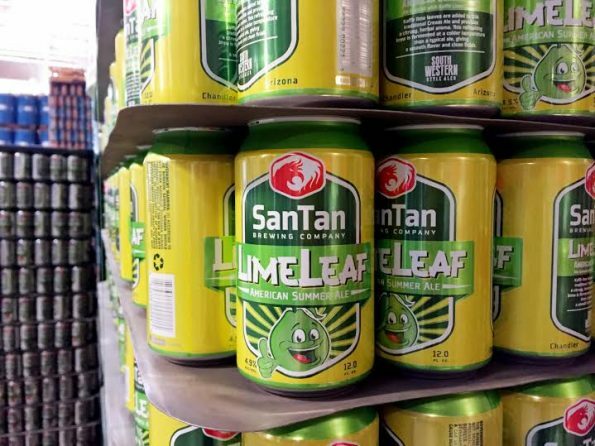 Brewed for the southwest, SanTan Brewing Company’s summer seasonal beer, LimeLeaf Summer Ale, is now available in cans and for regional distribution. A deliciously refreshing summer ale, LimeLeaf is made with a traditional cream ale base. Kaffir lime leaves are added for a citrusy and herbal aroma. This refreshing brew is fermented at a colder temperature than a typical ale, giving it a smooth flavor and clean finish. “I’m thrilled to launch our LimeLeaf Summer Ale in cans this summer. This is a great brew to take along for a trip to the lake, beach or river. It’s light and refreshing with a kick of hydrating citrus. The Kaffir lime leaf flavor really pops,” said Anthony Canecchia, founder and brewmaster, SanTan Brewing Company. Available at craft beer establishments on tap and in cans featuring SanTan’s fresh new look, LimeLeaf will be available in Arizona, California, Texas and New Mexico beginning April 25, 2016.